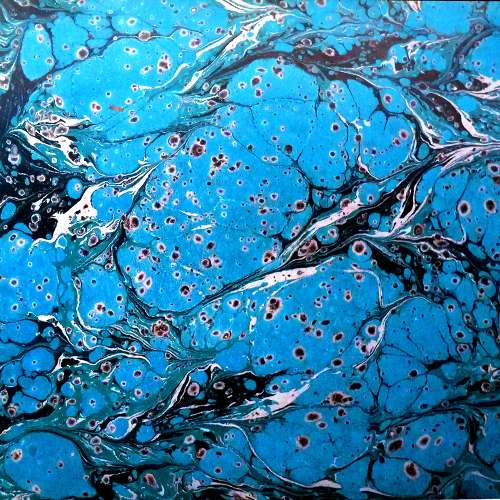 When we look at the works of ebru made by the masters using traditional Turkish techniques, we see clusters of colors which resemble the form of clouds. Persian word ebri has the meaning of cloud-like. In time the word ebri was adapted to the turkish language and has come to be pronounced as ebru. 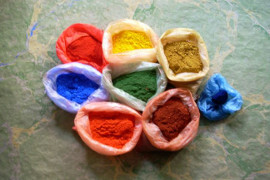 According to another account, the word originates from Ab-ru, which in Persian language means water surface and this word is used because Ebru is made on an aqueous surface1. However, old documents, published or hand-written, suggest otherwise and we see that the word ebri is used in writing and in speech, by masters such as Necmeddin Okyay.1. 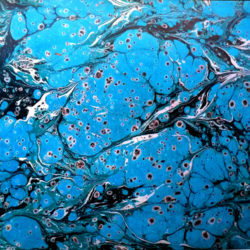 In Europe, Ebru was named marbled paper (or papier marbre, marmor papier etc. ), since the patterns resembled marble with veins. 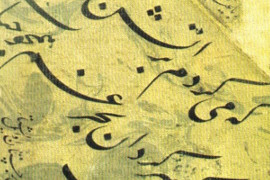 In Arabic world on the other hand ebru paper is known as varaku’l-mücezza (paper with veins). 1 see, Medeniyet Aleminde Yazı ve İslam Medeniyetinde Kalem Güzeli, Mahmud Bedreddin Yazır, p. 194. *Translated and adapted from Türk Sanatında Ebru by Uğur Derman, Ak Yayınları, April 1977.